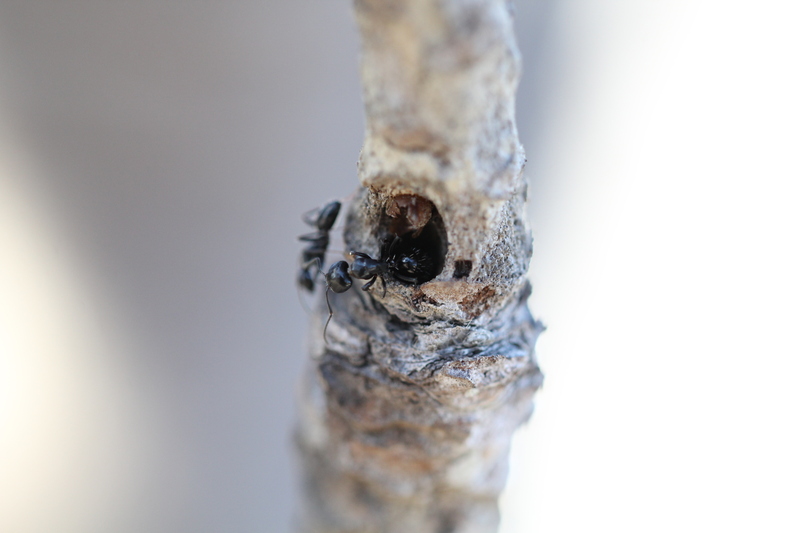 Solitary and sub-social bees such as the allodapines, anthophorids, xylocopids and megachilids construct their nests in the branches and stems of dead plants. 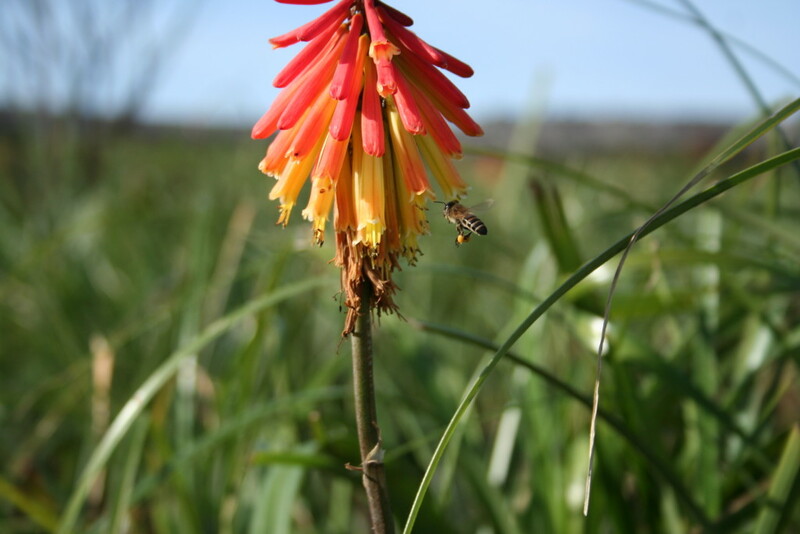 Such nesting sites include the inflorescences of Aloe species and stems of Kniphofia, Watsonia and various Iridaceae species that contain pith which is excavated to form a chamber. In the case of the allodapines, the pith is removed, the entrance is narrowed and the eggs are laid within this chamber so formed. The megachilids have a more elaborate system where pieces of leaves are removed from plants and used to line their cavities. 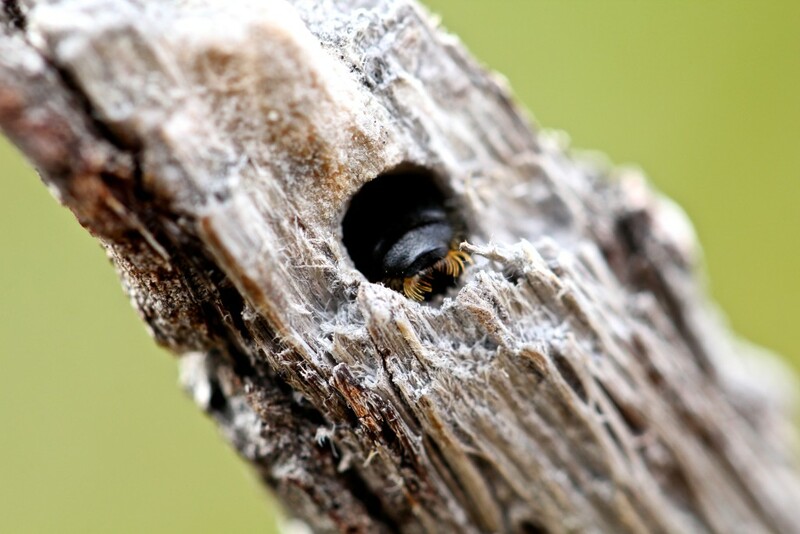 The much larger carpenter bees or xylocopids excavate tunnels in dead branches which are protected from rain, and construct partitions between the individual cells, each of which is provisioned with a lump of a paste consisting of nectar and pollen on which a single egg is laid. 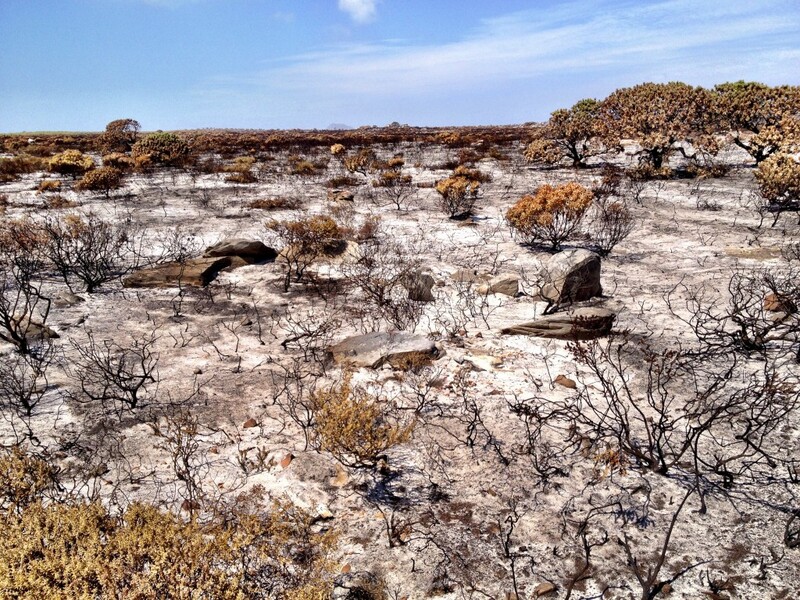 These nesting sites being composed of dead plant material are thus highly flammable in a vegetation type whose existence relies on regular fires at about 15 year intervals to maintain itself. This would indicate that a fire would be highly detrimental to the local existence of these solitary and sub-social bee species. 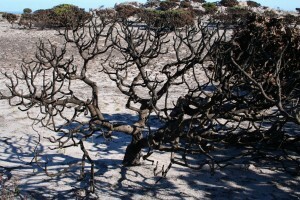 The fates of the solitary bees after the recent fire in Cape Point Nature Reserve following a lightning strike were investigated. Fig. 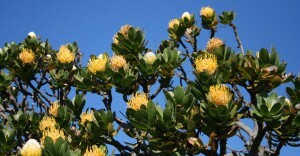 1a.The pincushion Leucospermum conocarpodendron in flower. Fig. 1b. A dead Leucospermum conocarpodendron containing several nests of allodapine bees in the tips of its branches. 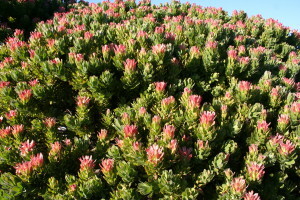 Figure 1c.The Mimetes fimbriifolius in flower. Fig. 1d. 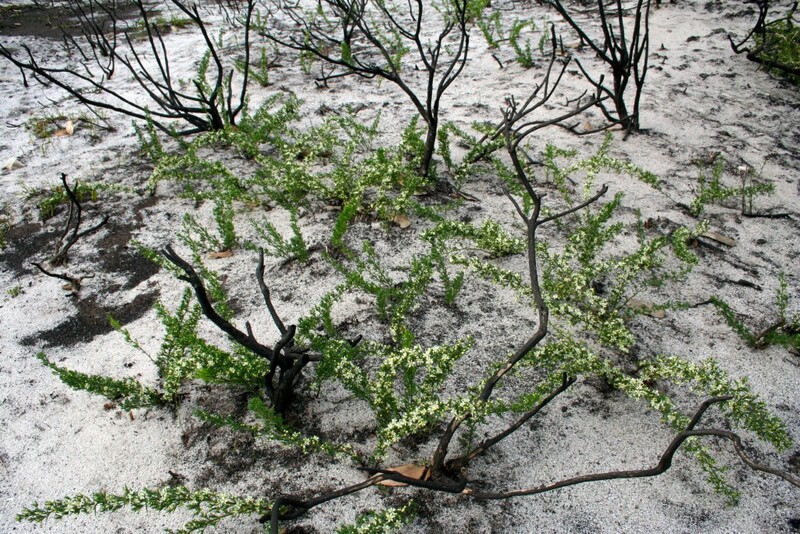 A Mimetes fimbriifolius after the fire. 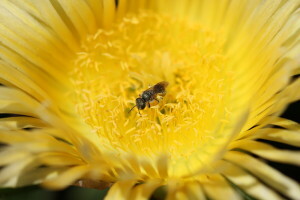 Within the park allodapine bees were found to construct their nests most frequently in the dead branch tips of the pincushion Leucospermum conocarpodendron and the Mimetes fimbriifolius (Fig. 1a+b+c+d) by hollowing out the pith and then artificially constricting the entrance which they defended either with their heads or stings protruding (Fig. 2a+b). Fig. 2a. 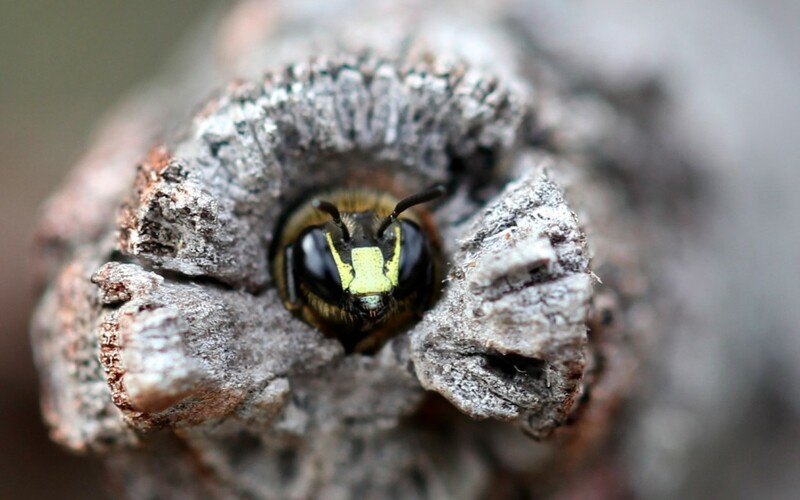 The head of an allodapine bee protruding from the entrance to its nest in the tip of a dead pincushion bush. Fig. 2b. The sting of an allodapine bee protruding from the entrance to its nest in the tip of a dead pincushion bush. 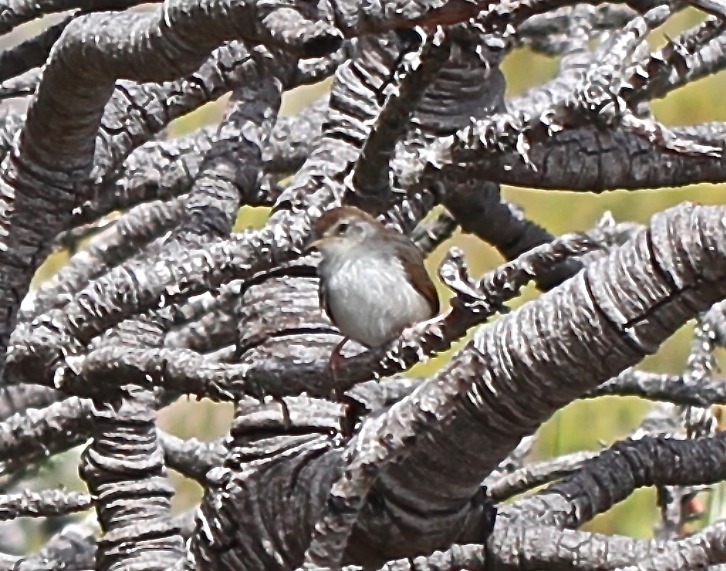 Several such nests could be found on one bush, the number appearing to be determined by the number of tips that had been broken and the pith exposed. 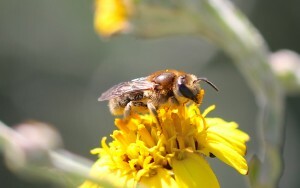 The bees were observed collecting nectar and pollen from a wide variety of indigenous plants whose flowers were mostly yellow and the pollen easily obtainable for species which do not possess baskets on their legs to pack the pollen, but instead remove the pollen coating their hairy bodies on their return to their nests (Fig.3a+b). 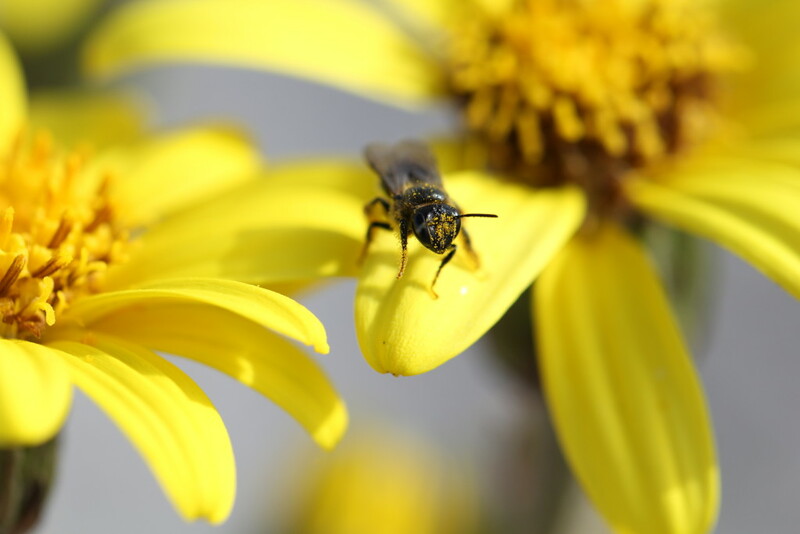 Some of the plant species that they pollinated were very small with tiny flowers and thus play an important, if largely unnoticed, ecological role in the maintenance of the fynbos. Fig. 3a. Allodape visiting a Daisy flower. Fig. 3b. 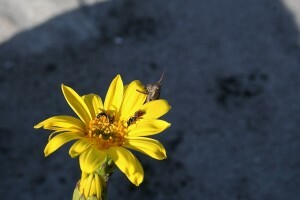 Halictidae visiting a Metalasia muricata flower. The fire was indeed disastrous for these bees nesting in dead plant material since nearly all the nests were incinerated. Only the distal ends of a few individual nests in thicker tips of the pincushions and Mimetes survived although the entrances had not been reconstructed four weeks later, and the nests were seemingly deserted. 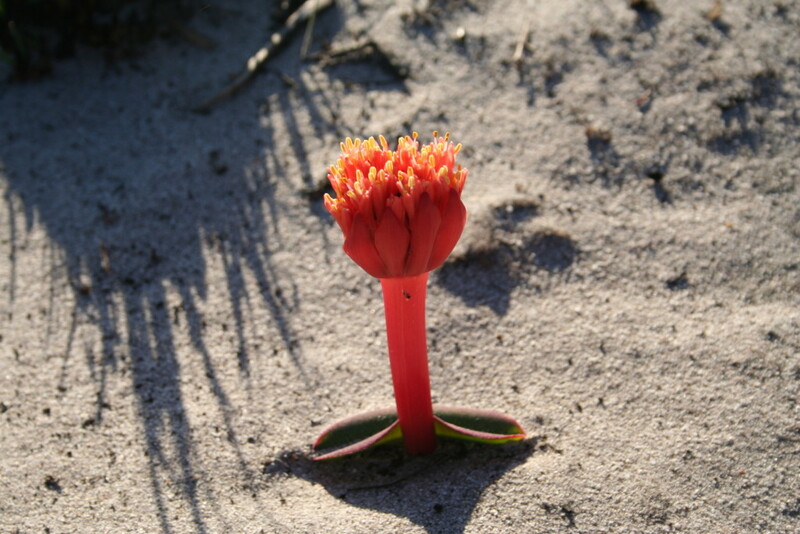 Plants which respond to a fire and owe their continued existence to regular fires such as the fire-asparagus Asparagus lignosus, Kniphofia uvaria and Haemanthus sanguineus were in flower within three weeks and were already visited by various solitary bees within this burnt area (Fig. 4 a, b, + c). 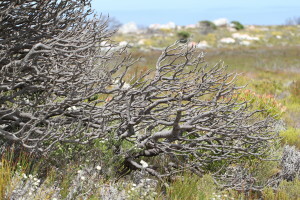 Had they migrated into this area from the un-burnt fynbos and established new nests? No new nests were observed but singed and still living Leucospermum conocarpodendron and Mimetes fimbriifolius bushes now had dead tips which presumably could provide new nesting sites for immigrant bees. 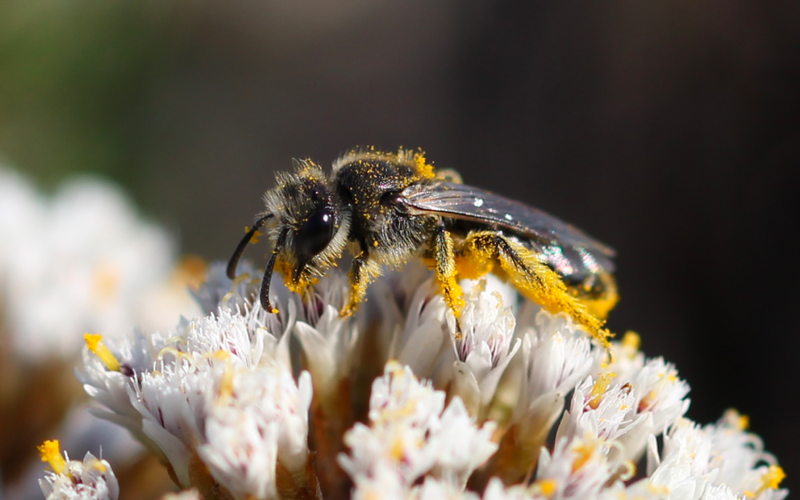 The ecology of most of these solitary bees is unknown and yet they appear to play an important role within the fynbos. 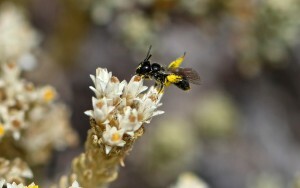 An example of this, not previously recorded is the interaction between the allodapine bees nesting in the tips of L. conocarpodendron and the neddicky (Cistocola fulvicapilla) (Fig.5) bird inhabiting the fynbos. 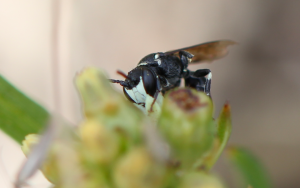 The neddicky feeds on small insects and their larvae (Ginn et al. 1990). In the presence of ants attempting to enter the allodapines’ nests, the allodapines would respond with a high-pitched piping sound and the intruder would invariable leave. 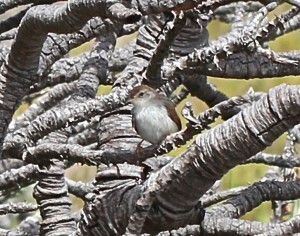 This sound was recorded and then replayed in front of individual nests not being harassed by ants. This would result in the resident allodapine appearing at the entrance and similarly piping. 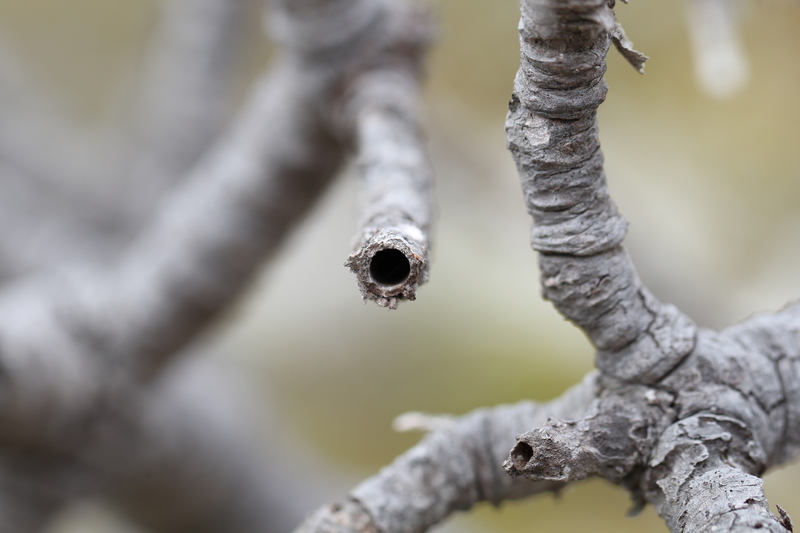 Unexpectedly, a neddicky bird was observed moving around these branch tips containing several nests and producing a similar sound to the detriment of the bees which stuck out their heads and were plucked out by the bird and eaten. Fig. 5. Neddicky, Cistocola fulvicapilla. 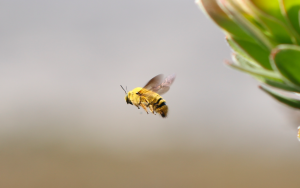 The fire occurring at the end of the season when most allodapines of the next generation would have dispersed to construct new nests would result in the local extinction of the bees within the burnt area. 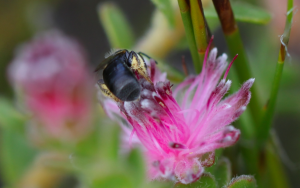 Yet the post-fire response of the fynbos plants which came into flower appears to have begun a re-colonization of the area by the solitary bees. 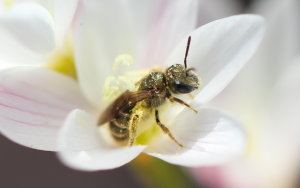 Acknowledgement: We thank SANParks Table Mountain National Park for permission to study these bees within the park. Ginn, P.J., McIlleron, W.G. & Le S. Milstein, P. (Eds) 1990. The Complete Book of Southern African Birds. Struik Winchester, 760pp. This entry was posted in Uncategorized on June 13, 2015 by ujubee. We are thrilled that they are here but worried about what could happen if they are disturbed. The birdbox is not large enough to safely fit the whole swarm. Last night (their 1st night) – a good few hundreds were left outside but they (thankfully) survived the night. This morning they took a while to warm up and even though virtually the whole swarm have left there are still a good few “working” the birdbox and I suspect they may return this evening… but I know nothing about bees so possibly they’ll move on as it’s not large enough for them all. What should I do (if anything) should they return? I am worried that our landlord (who lives next door) may harm them as he is not an environmentally-friendly fella. I do know a bee-remover (who would cherish them) but if you advise that we should just let them “bee” we will do. Our landlord mows our lawn every couple of weeks and I’m concerned for them should he spot them. We live in Constantia, Cape Town.